Looking back on her career in 1977, Bette Davis remembered with pride, "Women owned Hollywood for twenty years." She had a point. Between 1930 and 1950, over forty percent of film industry employees were women, twenty five percent of all screenwriters were female, one woman ran MGM behind the scenes, over a dozen women worked as producers, a woman headed the Screen Writers Guild three times, and press claimed Hollywood was a generation or two ahead of the rest of the country in terms of gender equality and employment. The first comprehensive history of Hollywood's high-flying career women during the studio era, Nobody's Girl Friday covers the impact of the executives, producers, editors, writers, agents, designers, directors, and actresses who shaped Hollywood film production and style, led their unions, climbed to the top during the war, and fought the blacklist. Based on a decade of archival research, author J.E. Smyth uncovers a formidable generation working within the American film industry and brings their voices back into the history of Hollywood. Their achievements, struggles, and perspectives fundamentally challenge popular ideas about director-based auteurism, male dominance, and female disempowerment in the years between First and Second Wave Feminism. 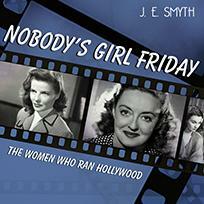 Nobody's Girl Friday is a revisionist history, but it's also a deeply personal, collective account of hundreds of working women, the studios they worked for, and the films they helped to make. For many years, historians and critics have insisted that both American feminism and the power of women in Hollywood declined and virtually disappeared from the 1920s through the 1960s. But Smyth vindicates Bette Davis's claim. The story of the women who called the shots in studio-era Hollywood has never fully been told—until now. J. E. Smyth is an American historian and film critic. She is a regular contributor to Cineaste Magazine and has appeared in documentaries for the BBC and PBS. Smyth is Professor of History at the University of Warwick (UK). For more information, visit jesmyth.co.uk.